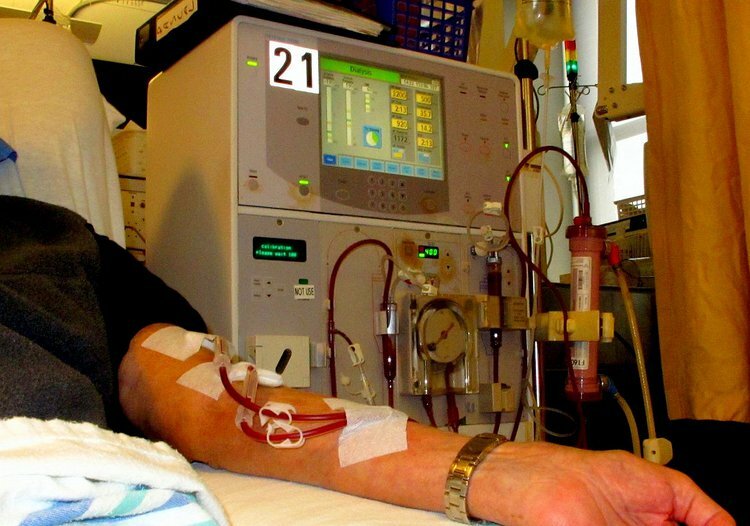 Image showing an individuals arm while receiving dialysis (the reason a declot would be necessary). A Dialysis Fistula/Graft Declotting Intervention procedure is commonly performed in the veins of the groin or neck. Why is the Dialysis Fistula and Graft Declotting radiology procedure Performed? When a blockage occurs in the fistula or graft, it can prevent a patient from undergoing a dialysis. Dialysis Fistula and Graft Declotting procedures are designed to help improve blood flow in the fistula and grafts, placed in the blood vessels. There have been no recent advances with respect to Dialysis Fistula and Graft Declotting procedures. What is the Cost of performing the Dialysis Fistula and Graft Declotting radiology procedure? The cost of a Dialysis Fistula/Graft Declotting Intervention procedure depends on a variety of factors, such as the type of your health insurance, annual deductibles, co-pay requirements, out-of-network and in-network of your healthcare providers and healthcare facilities. It is normal for a patient to feel uncomfortable and confused with a sudden inflow of information regarding a Dialysis Fistula and Graft Declotting procedure and what needs to be done. How does the Dialysis Fistula and Graft Declotting radiology procedure work? How is the Dialysis Fistula and Graft Declotting radiology procedure Performed? Dialysis Fistula/Graft Declotting Interventions are performed as outpatient procedures, at a hospital. An interventional radiologists perform the Dialysis Fistula/Graft Declotting Intervention procedure. A catheter thrombolysis usually takes about less than an hour. An interventional radiologist interprets the results of the Dialysis Fistula and Graft Declotting procedures. This is then informed to the patient by the healthcare provider. A physician will request your consent for the Dialysis Fistula and Graft Declotting procedures using an Informed Consent Form. What are the Limitations of the Dialysis Fistula and Graft Declotting radiology procedure? What are Dialysis Fistula and Graft Declotting procedures? What is to be expected during the Dialysis Fistula and Graft Declotting radiology procedure? The patient is administered general anesthesia for the Dialysis Fistula and Graft Declotting procedure. Dialysis Fistula and Graft Declotting procedures are minimally invasive; they involve little to no blood loss. What are the possible Risks and Complications during the Dialysis Fistula and Graft Declotting radiology procedure? What Post-Operative Care is needed at the Healthcare Facility after the Dialysis Fistula and Graft Declotting radiology procedure? There is no postoperative care necessary after a Dialysis Fistula and Graft Declotting procedure, at the healthcare facility. What is to be expected after the Dialysis Fistula and Graft Declotting radiology procedure? If there is no improvement in one’s condition after the procedure, then do contact your physician. What Post-Operative Care is needed at Home after the Dialysis Fistula and Graft Declotting radiology procedure? No tissue is extracted from the patient during a Dialysis Fistula and Graft Declotting procedure. Who will you receive a Bill from, after the Dialysis Fistula and Graft Declotting radiology procedure? The patient is advised to inquire and confirm the type of billing, before the Dialysis Fistula and Graft Declotting procedure is performed.